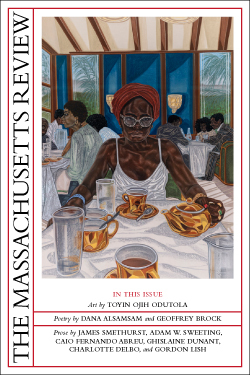 The Massachusetts Review helped celebrate the 50th anniversary of the UMass MFA for Poets and Writers! Many of our interns, editors, and contributors are graduates of the program, and shared their work at an event reading recognizing the MFA's golden anniversary. National Book Critics Circle Award-winner Mira Bartok reading selections from MR's Spring 2014 issue. MR's Poetry and Translation Editor, Ellen Dore Watson, reading new work from the Spring 2014 issue and beyond. Former MR Managing Editor Aaron Hellem reads from his new work! Poet Robert Dow reads from a selection of his work.